Along with new skate parks comes new talent. 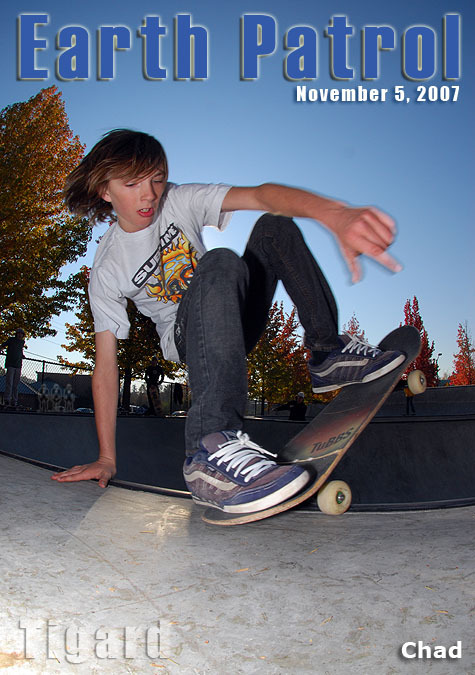 This week’s featured Monday Cover skater is Chad, a local at the newly opened park in Tigard. Check out Chad’s styling layback in the flow bowl, super smooth. Congratulations Chad and keep the stoke! Nice shot. That kid was pretty rad. Nice work, Chad – keep it up! Rad, groovy, far out and neato kiddo! Chad Fenlon? He’s been on our case for a couple of weeks now to come check him out. How much did he pay you to post this? Ha ha. He was ripping it up there yesterday, AND he helped me dry the bowls beforehand with towels. He kills Holly Farm as well. Fearless, stylish, and really fast. Way to go Chad. Wow, I always knew he had talent! skated with him in Tigard on Sunday…the kid rules, he’s got style, speed and old school moves. This kid is actually cool with the older guys and just wants to shred without “the street kid vs. bowl barney” attitude so common at the parks. Are you talking about Shreddi Repas from 70’s 80’s ??? No one likes one person this much . Or do They? Lets just see. Anybody knows how to reach him? Tigard skatepark everyday after school or Lab 33–who he skates for now. omg Chad on the cover of a mag lol. Last i remember he could only do front side grinds. He always loves to do the front lay backs. Too bad he still didn’t life here fun kid to skate with. Not a ripper but hes good for sure.